The relationship between artists and fashion designers is often very close. In the late 1960s and early 1970s the Scottish-Italian artist Eduardo Paolozzi created a series of prints called "Moonstrips Empire News". These captured the attention of Jules-François Crahay, head designer for Lanvin from 1964 to 1984. 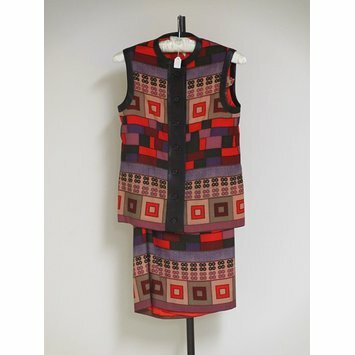 He commissioned special fabrics based on Paolozzi's designs which were exclusive only to Lanvin's Spring-Summer collection of 1971. This tailored two-piece, which Crahay called 'Malaga', was designed to be worn as day-wear. 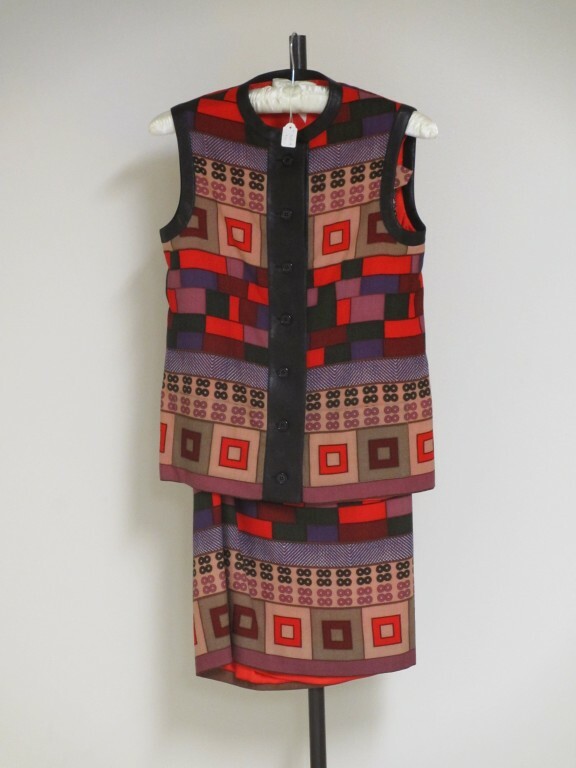 The sleeveless tunic and skirt are worn with a solid brown long-sleeved jumper, belt and scarf to focus attention on the vibrant pattern. Day ensemble comprising a jacket, skirt, jumper, belt and scarf made from 100% wool (Trade name Bombyx), printed with a multi-coloured design in shades of brown, beige, red and purple, and trimmed with shiny brown vinyl.